PORTLAND, Maine — Maine’s only shipping container terminal will welcome its biggest vessel ever next week as international freight business has picked up a lot of speed through the port of Portland. According to the Portland Press Herald, Eimskip, an Icelandic freight company headquartered in Portland, introduced last week the Pictor J, a 461-foot container ship, on the company’s trans-Atlantic shipping route between Portland and Reykjavik. It is expected to arrive in Portland next week. Container traffic through the terminal has almost tripled since Eimskip made Portland its U.S. headquarters six years ago, the Press Herald says. 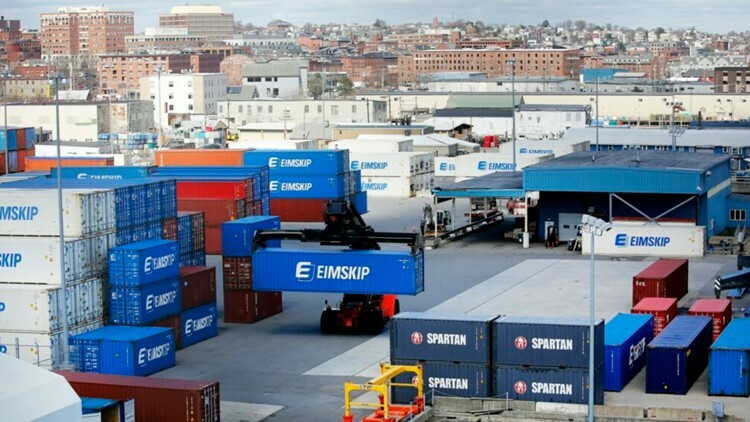 Andrew Haines, executive vice president of Eimskip USA, said last year, Portland handled 22,325 container units, and is on track to grow by 40 percent in 2019. “We have had a tremendous start to the year; the growth has been much larger than expected,” Haines said to the Press Herald. Eimskip added weekly service from Iceland to Portland with stops in Halifax, Nova Scotia, and Newfoundland at the end of 2017. Two other ships service that line: the Skógafoss, a 426-foot ship with 686-container capacity, and the EF Ava, also 426 feet long with space for 698 containers.